Make Liberland great again: The leaders of an unrecognized Balkan, Libertarian, utopia attend the inauguration. Liberland President Vit Jedlicka and supporters at the inauguration. Foreign leaders were few and far between at Friday’s inauguration in Washington. Benjamin Netanyahu declined an invitation. Justin Trudeau’s office sent his regrets. That’s not unusual: Foreign governments typically send their ambassadors,= while the prime ministers and presidents stay home. But at least one head of state did make the trip. I met up with Vit Jedlicka, president of the Free Republic of Liberland, and his delegation of about 20 people, just outside the Federal Center metro stop Friday morning. They were running a little late, after a successful pre-inauguration night out at an Americans for Tax Reform gala but were in good spirits, excited to be representing the world’s newest country (according to them anyway) at the swearing-in and enjoying their time in D.C. so far. “We got an Uber driver to accept Bitcoin yesterday,” the president told me with evident satisfaction. Jedlicka, a 33-year-old libertarian politician and activist from the Czech Republic, planted (literally) the flag of Liberland on the banks of the Danube on April 13, 2015. At 2.7 square miles, it would be the third smallest country in the world after the Vatican and Monaco if it were recognized as a country. The territory is a disputed area between Serbia and Croatia, but—unusually for a territorial conflict—the issue is that neither country wants it. The land is under Croatian control, but the Croatian government wants to cede it in exchange for other parcels of land controlled by Serbia. Liberland claims this makes the territory, terra nullius, or unclaimed land, and therefore available for the creation of a new country, in this case, one for those who share Jedlicka’s libertarian beliefs: Taxes will be voluntary in Liberland, and public services provided through private enterprise or crowdfunding. According to Jedlicka, about 240 people, living throughout the world, are now officially citizens of Liberland, and more than 435,000 have expressed interest in citizenship online, including 12,500 from the United States. The only problem is that no one is currently able to live in Liberland. Croatia has prevented Liberlanders from crossing the land border into the territory or establishing permanent residences there. (Though Jedlicka notes with satisfaction that a member of Croatia’s Parliament came out in their defense this week.) 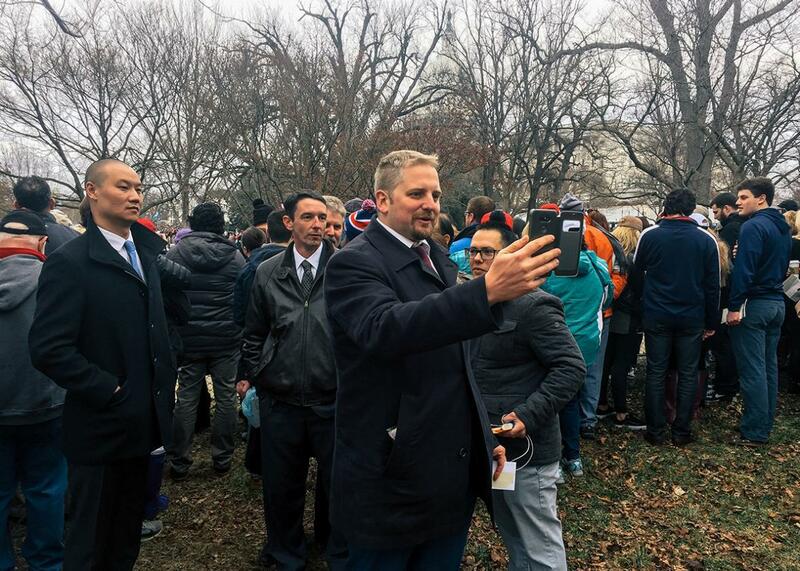 The fact that nobody actually lives in Liberland yet, and no other governments have recognized it, hasn’t stopped Jedlicka, who lives in Prague, from promoting the project around the world, hence the visit to D.C.
Liberland supporters in the U.S. scrounged together the tickets for the delegation by asking members of Congress. “They didn’t necessarily know they were inviting us,” concedes Dave Molineaux, a Liberlander from Charlottesville, Virginia. Molineaux says he got involved in Jedlicka’s project after reading about it on libertarian news sites, deciding it was “something I can really get behind.” He’s optimistic that the U.S. will eventually recognize Liberland. I asked Dave Vice, a Liberlander from Utah, if he thought Trump shared Liberland’s values. “He’ll get there sooner or later,” he said, suggesting that Trump was part of a global anti-establishment wave. Jedlicka is relatively bullish on Trump too, he told me as we made our way through the security checkpoints onto the mall. “He’s an entrepreneur and we’re going to be entrepreneur-friendly,” he said. “I think he will understand how we strive to get rid of regulations. Maybe he will move the United States a little bit more toward Liberland.” He also said he hoped he could leverage the Trump family’s Czech connections to Liberland’s advantage. He said he was in communication with the offices of several elected officials in D.C. but declined to name any he might be meeting with. Along with the crowd, we were funneled onto a knoll, southwest of the Capitol steps, with a partially obstructed view of the Jumbotron. “I thought we’d be a bit closer,” mumbled one member of the delegation. For much of the ceremony, Jedlicka struggled to get a strong enough cell signal to livestream a message to people at the opening of a new libertarian think tank in the Czech Republic, happening at the same time. The man in a suit and tie speaking Czech into his phone got a few quizzical looks from the MAGA crowd around us. As Trump began railing against trade deals and the loss of American jobs overseas during his speech, Jedlicka winced a bit. “I’m not sure about this protectionism. That’s probably where we differ,” he said of his fellow head of state. And with that, as America’s 45th president receded into the Capitol, Liberland’s first finally got a strong enough signal to broadcast this milestone moment for both countries.